Policy Update - The Policy Department invites you to receive monthly updates on ICANN policy development activities through a free online subscription to the ICANN Policy Update. To subscribe, simply visit the ICANN Subscriptions page, enter your e-mail address, and then click on the ICANN Policy Update. Issues of the Policy Update are also posted here for your information and reference. Policy recommendations are formed and refined by the ICANN community through its Supporting Organizations (SOs) and influenced by Advisory Committees (ACs) – all comprised of volunteers from countries and territories – in a "bottom-up," open and transparent process. Each Supporting Organization has its own specific process to conduct policy development. 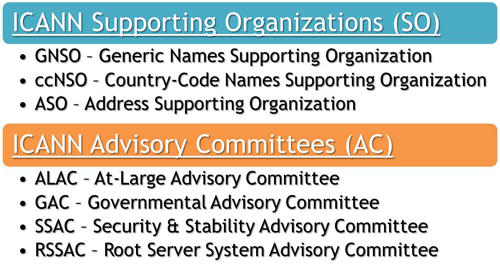 For the Generic Names Supporting Organization (GNSO) this is process is outlined in Annex A of the ICANN Bylaws, for the Country Code Supporting Organization (ccNSO) it is contained in Annex B of the ICANN Bylaws, for the Address Supporting Organization (ASO) it is laid out in the Memorandum of Understanding. A sample of ICANN stakeholders includes companies that offer domain names to the public (registrars), companies that operate top-level domain registries (gTLD and ccTLD registries), Internet Service Providers, intellectual property interests, business users, non-commercial users (such as academics, non-governmental organizations, non-profits and consumer advocates), individual Internet users and governments.